This is my favorite "this-couldn't-possibly-have-beans-in-it" cream sauce. I made it this time with asparagus & carrots, but its amazing with cauliflower and really good with zucchini as well. 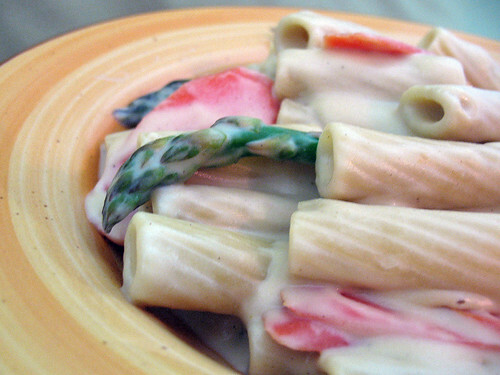 At some point, I'm going to make this sauce with zucchini ribbons instead of pasta. That should be a treat. The sauce really complements veggies and tastes amazing. Combine all ingredients and blend. It's important that you use boiling water or the cashews won't cream up and the sauce will be gritty. Also, I use an extra large blender, so you may need to do this in a couple batches. And, finally, don't be afraid to add a little extra water. If you're combining it in a hot pan, you with pasta, the pasta will absorb some, and it will cook off a bit in the pan. This makes a lot of sauce. Easily enough for a pound of pasta loaded with veggies, but it's great just poured over veggies. If you don't use a whole batch, I'll bet it freezes nicely. Love the Cashew Cream idea for dressing. And of course adore chickpeas. Have you heard of "The Indian Slow Cooker" book?? Anupy has a ton of chickpea recipes in there, black and white, and VEGAN!! She uses dried beans, no soak, no prep......oh, and cheap!! I've seen that cookbook, but haven't gotten it yet. I still associate slow cookers with pot roasts and other hunks of meat. Mine hasn't gotten much use in a long time. Absolute genius to use beans (garbanzos no less!) in this. I assume a light-color (and thus flavor) miso works best for this? Also, the genius appears to be the combination of chickpeas and cashews for just the right consistency. I use light miso, but others should work as well. Wow. This is such a fantastic and innovative idea. Thanks for the recipe! Yummy!! I will definitely be trying this one soon as I think my kiddos would love it! I just made this......and am having problems! Found that I needed to add a lot of extra salt to boost the flavor and a bit of dijon mustard as well. But my main problem was that I just couldn't get my sauce to be creamy! I used boiling water, but it is still gritty. Any suggestions for the texture? We really like the flavors!!!! Shoebotmom, I don't know your situation, but here are a few pointers. 1)if you blender isn't good, you can grind the cashews in a grinder beforehand (or leave the bottom little bit in the blender). 2)I blend my sauces for a good 5 minutes. 3)this makes a lot of sauce. You may want to blend it up in two batches. A blender doesn't work well if it's over full. Also, I do tend to go light on the salt in my recipes. As it's a lot easier to add salt than to remove it. I hope this helps. If not, please report back. Good Luck. Thank much Matt! Perhaps you are right and I just didn't blend long enough. It was good anyway, despite the bit of texture. My (super picky and fussy and wary of all things new) girls even ate our pasta with this sauce and loved it! I will definitely be making it again.......and blending more! Thanks much! That must be some blender if you can put boiling water in it! Mine specifically says you can't, and I've killed a blender in the past by doing that. Are you using a vita mix or something? I finally splurged and got a good blender a couple months ago--and love it. But I used boiling water in my cheap $19 Oester routinely. The tricks is to remove the center piece from the lid and cover it with a paper towel. That way pressure doesn't build up and it doesn't splatter. Also, don't overfill it. Ok. This just moved to the top of my "to try" list. I was glad to read the comment that it needs to blend for a long time as I often don't blend long enough. Thanks for a great idea. Another good tip for blending nuts is to soak them ahead of time. Just put the nuts in a large bowl and cover with water by at least an inch or two. Let them soak for an hour or two, or even overnight (just stick the bowl in the fridge). The nuts will soak up a lot of water, plump up, and be much softer and easier to blend. Drain the nuts well, then use them as directed in the recipe. If you have a VitaMix or Blendtec, you can get away with skipping this step, but I found it made all the difference when I had a more simple blender. In fact, I STILL do it for my Blendtec when I want to be absolutely sure that everything will be ultra-creamy. This was good! I found that 2 cups of water was plenty though, 4 cups seems like it would have gotten really runny. Also added fake parmesan at the end, and a little Earth balance butter. Kids liked it! This is absolute BRILLIANCE!!! There....I said it....and I mean it. Very delish....very. Thanks for the recipe!! !